HOT DEAL: DVD player bargains from just £40 | What Hi-Fi? 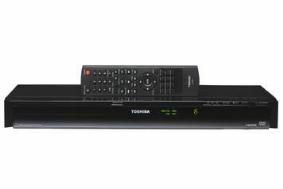 You can pick up a Toshiba SD380 upscaling model for just £40, the five-star XD-E500 for £99, or alternatively a compact Samsung DVD-F1080 for £60. And there are bargains to be had on DVD recorders too. Panasonic's DMR-EZ28 is all yours for £137, or you can get the same company's DMR-EZ48 DVD/VHS recorder combi for £218. And if you want a DVD recorder with Freeview, there's Samsung's DVD-SR270M for £223. Check out the latest deals at Amazon's DVD store.